I've got Abbe (Abbe's Cooking Antics) to thank for introducing me to scones. It was one of those 'things' I skipped at afternoon teas because I was sure it couldn't beat the likes of peach tart, scrumptious sandwich or decadent cake. After trying this recipe out, I realised what I had been missing out on. These days, I don't hesitate to make a tray of my own, and I like pairing it with fruit based curries like pineapple pajeri or mango dal. Is that a strange way of eating scones? ... Anyway, it is for this reason that I have greatly reduced the amount of salt in this recipe. 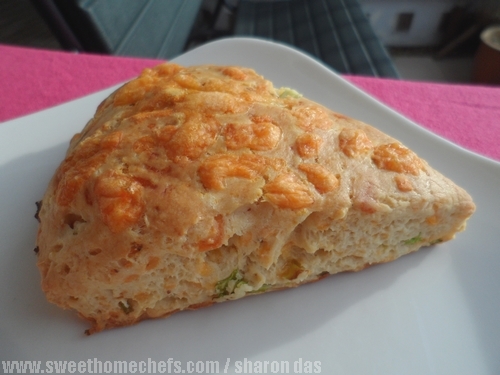 Recipe adapted from Abbe's Cooking Antics - Spicy Mexican Cheddar Scones. I have highlighted the differences in purple. 1) Shred the cabbage, chop the spring onions. 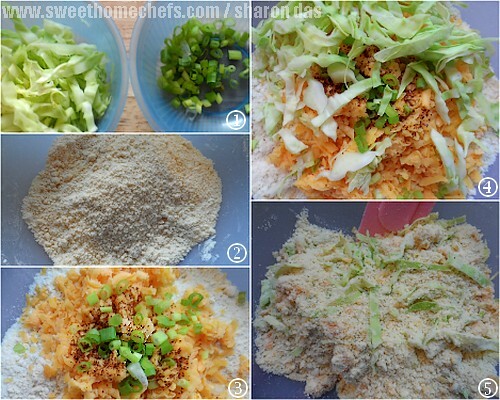 2) Rub flour, baking powder, salt and butter together until it looks like large breadcrumbs. 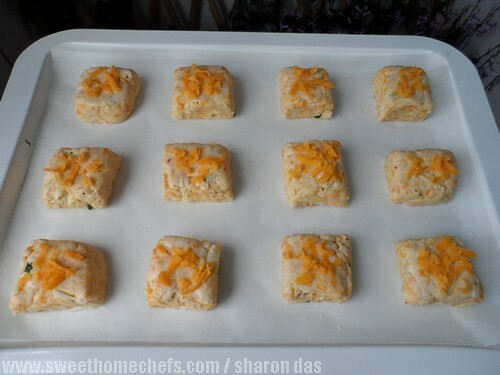 3) Add cheddar, chili flakes and spring onion. 1) Add milk to form a dough. Knead lightly on floured surface. 2) Roll into a circle and cut into pieces. 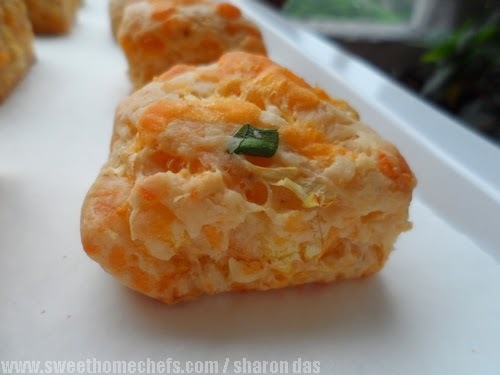 3) Brush top with milk and sprinkle cheddar on. 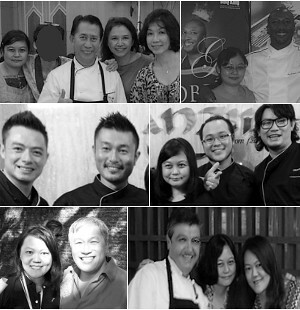 This was how I first did it (above) and then, I did it my way (below). 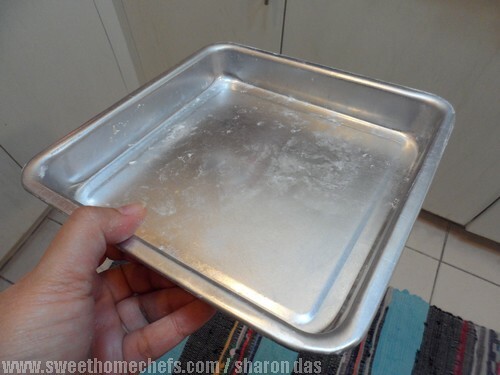 Use a 7in square cake tin (1in deep). Flour it. Press the dough into the cake tin. Then, lift it out onto a floured surface. 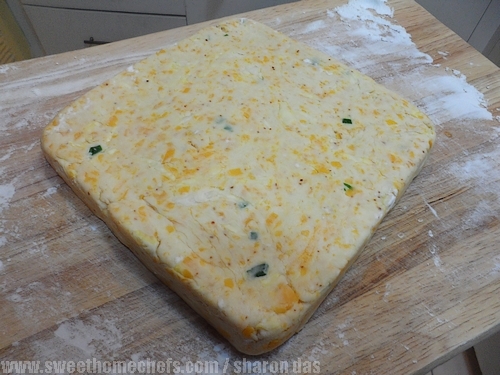 Using a long knife, cut it into equal squares. It's done and ready to be eaten! 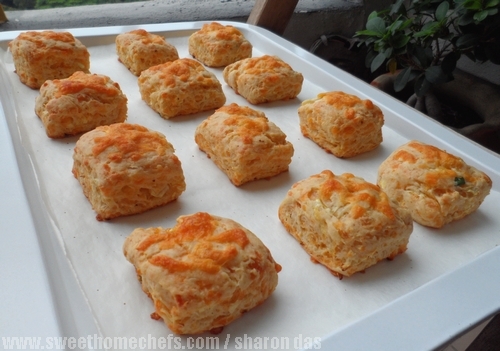 A close-up of fantastic spicy Cheddar scone. Did you smirk? 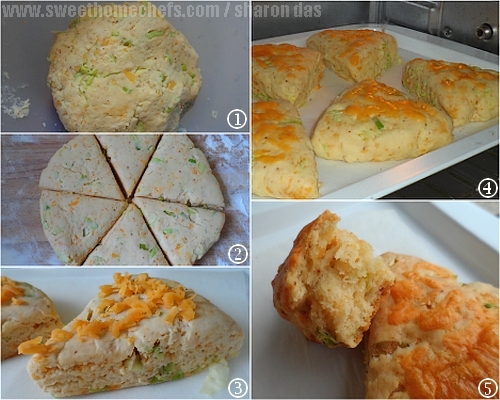 Wow Sharon, these scones look fabulous...I have never bakes scone, but seeing yours made me want to try...like the cheese and the flakes of chili...and love the cabbage in it.